Nyx Llorca keeps two secrets: the moon speaks to her, and she's in love with her best friend, Dahlia. Braeden Tennant wants two things: to get out from his mother's shadow, and to unlearn his colony’s darkest secret. To save everyone they love, they'll both have to commit treason. 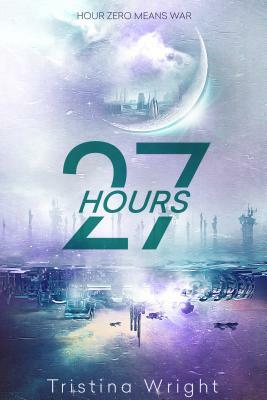 During one twenty-seven-hour night, these four runaways must stop the war between the colonies and the monsters from becoming a war of extinction, or the things they fear most will be all that's left. Tristina Wright is a blue-haired bisexual with anxiety and opinions. She’s also possibly a mermaid, but no one can get confirmation. She fell in love with science fiction and fantasy at a young age and frequently got caught writing in class instead of paying attention. She writes stories about people who are heroes and monsters and sometimes both. She enjoys worlds with monsters and kissing and monsters kissing. She married a nerd who can build her new computers and make the sun shine with his smile. Most days, she can be found drinking coffee from her favorite chipped mug and making up more stories for her wombfruit, who keep life exciting and unpredictable.